The day after I arrived home with my new baby boy, I was hit with severe postpartum depression. I never thought it could happen to me and it came out of nowhere. I went from filling out all 1’s on the happy scale the hosptial gives you before sending you home to being at home thinking I had made a terrible mistake becoming a mother, and trying to figure out ways I could get sick or hurt so I could return to the hospital where everyone would have to take care of me and I never had to take care of a baby. How do you tell your mom friends you feel this way when you have been led to believe the only normal feelings new moms experience after giving birth are magic, bliss, joy, love, and an intense attachment to your baby? How could I tell them the only thing I felt was paralyzing anxiety that made it difficult to do anything but cry ugly tears and lie in bed pleading for it to all go away so I could love my new baby boy and be a good mother too. How could I tell them I resented them for being so much better at motherhood than me? So much better at breastfeeding. So much better at simply wanting to spend time with their babies and leaving the house with them, something I was terrified to do. I didn’t have any friends who had postpartum depression before me. I didn’t even know postpartum depression was what I had until I found the right therapist who diagnosed me. Now I didn’t only have postpartum depression. I had to go on antidepressants and anti-anxiety medicine to cope with motherhood. Again, what would my friends think? From what I knew of other moms (close friends and the ones on social media I didn’t know personally), motherhood was easy and came naturally. I thought of myself as a horrible mom and a failure. I failed at breastfeeding. I failed at Pinterest. I failed at wanting to be a mother. Would my friends judge me as harshly as I judged myself? Of course, the answer is no. Even though none of my close friends had experienced postpartum depression and coudn’t fully understand what I was going through, they never abandoned me or made me feel ashamed about my feelings. Here are 7 ways my friends helped while I battled postpartum depression. None of my closest friends experienced postpartum depression, which made it very difficult to understand what I was going through. I was often too consumed by anxiety, tears and exhaustion to have to explain it–the therapy sessions, the procsss of finding the right medications, the not wanting anything to do with my son, the desire to never leave my bed ever again, the overwhelming guilt and so much more. My friends never pushed me. They never forced me to answer questions or explain what postpartum depression was like for me. They let me know they would always be there to talk if I needed to and when I was ready. They took the pressure away of having to explain myself, a huge relief for me. Even though my friends didn’t personally suffer from postpartum depression, they never judged me for having it. They educated themselves about what I was going through and always kept an open mind. If I felt like telling them something shocking such as wanting to run away and never come back or that I wasn’t sure I had any feelings for my new baby, they never made me feel bad about it (I did that enough to myself). Not once, did any of my friends try to insert their opinions or views about formula feeding or medication into my experience. They never pretended to know better. They never made me feel guilty. They supported all my choices and tried to help me understand I was sick with a real illness and not just a horrible mother. 3. They reached out without expecting anything in return. During the long months of my postpartum depression battle, my friends regularly called, emailed, and sent text messages. Their messages were filled with encourgement and love. “I love you.” “I’m thinkink about you.” “You got this.” “You’re strong.” “I’m proud of you.” “I’m always here for you.” “Your baby is taken care of and lucky to have you as his mom.” And not once, did any friend expect a response. They all knew that it was dififcult for me to be social and they selflessly kept in touch anyway. 4. They talked behind my back. After I got better, I found out that my friends would text and email about me behind my back. If anyone had spoken to me, they told the group. If I made progress, they told the group. One friend who usually came over to check on me and take me for walks, regulary updated the others. When I got better, I felt extremely grateful, loved, and flattered to know that I had my own personal cheerleading squad rooting for me to get healthy and happy. 5. They kept me fed. While the anxiety and sadness made it difficult to eat, my friends always made sure there were meals sent to my house. Not having to worry about who was cooking or where meals were coming from gave me more time to focus on my health and recovery. It also took that responsibility away from my husband who had to take on so much extra with me being sick. And you know my friends are the real deal because they never forgot to include chocolate. 6. They checked in on my husband. My husband needed support too. With me incapable of taking care of our son, he had to step up and parent for both of us, often after a long day of work and on less sleep. He needed people to vent to. He needed an outlet. He needed breaks. My friends checking in on him allowed him to express his feelings about a situation that was frustrating and difficult because it was unexpected for him too and he felt helpless because he couldn’t snap his fingers, give me extra hugs or buy me a present and make me better. It was important that he wasn’t forgotton about on my postpartum depression journey. 7. The celebrated my recovery. When I started to turn the corner and finally felt like myself again, an email went out from one mom friend to the rest of the group with the subject heading: “She’s baaaaaaaaaaaaaaacaaaack!” The sent email was a result of this mom watching me engage with and love on my baby boy who was now six months old. She could immediately see the change in me and wanted to celebrate it by letting my other friends know too. I still get emotional when I think about all the support, empathy and messages that told me how strong I was, how proud they were of me and how happy they were to have their Jen back. My friends were there every step of the way and it meant everything for them to celebrate with me at the end. 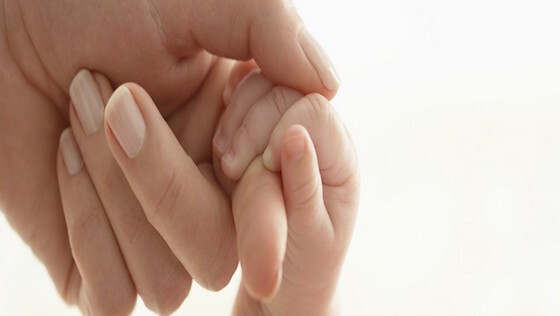 1 in 7 new moms will suffer from postpartum depression. That means, if you know 7 women, you will know one of these moms. She could be you. In addition to the above tips, you can download a free copy of my guide: WTF Are Postpartum Depression and Anxiety? and learn more valuable adivce and tips for how to help, what to do and what to never say. This article originally appeared on Red Tricycle. I AM A MEDICATED MOMMY! Yes, I take antidepressants. No, I am not ashamed. Not even a little bit. And if you do too, you shouldn't be ashamed either. Let's start at the beginning. On day six of being a new mom, I was overcome with crippling anxiety and non-stop tears. I had no desire to ever leave my bed again. All I wanted to do was sleep and go back to the hospital where people would take care of me and I didn't have to be responsible for the well-being of another human. Why did I become a mom? I believed I had made a terrible mistake. Obviously something was very wrong. After a diagnosis of postpartum depression followed by three rounds of different anti-anxiety medicine and two rounds of antidepressants, my therapist and psychiatrist finally found the right drug cocktail to help me. Yes, I felt frustrated while trying to find the right medication and it took some time, but I also found relief once I did. 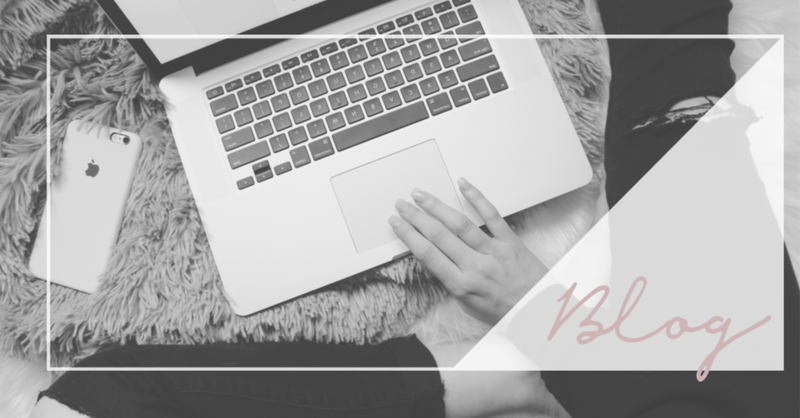 It was the first step to getting better, something I never believed would be possible while in the dark hole of postpartum depression. It was worth hanging in there for. My baby, husband and I were worth hanging in there for. My son is now almost four years old and while I have weaned off the anxiety meds I still take the antidepressants every morning. I will most likely take them for the rest of my life and I'm okay with that. And I'm cool with you knowing that about me. I'm proud of my journey--of the year long fight I put up against the postpartum depression--of my transformation into the fierce, courageous, compassionate, honest woman and mom whose words you are reading right now and isn't afraid to show her vulnerability. I realize that treatment for depression and anxiety are not one size fits all. What worked and continues to work for me might not be right for you. The important thing is to make sure you advocate for yourself. I am not a medical professional. I am a postpartum depression survivor who chose to accept her diagnosis, ask for help, and get the appropriate treatment. Postpartum depression as well as all postpartum mood disorders are very real, very common, and they go untreated way too often. If you had the flu or another type of illness, you would treat those wouldn't you? You wouldn't deny yourself the proper care. These disorders are illnesses too. And they are always temporary with professional treatment. I realize that medication isn't for everyone, but it's also not the devil either. If medication can help you get better, at least consider it while exploring all the options out there. There is absolutely nothing wrong with suffering from postpartum depression or anxiety. You didn't do anything wrong. You didn't ask to get sick. You are not a failure or a horrible mother. You have nothing to be ashamed of. Taking medication does not make you weak or any less of a mother. In fact, acknowledging you are struggling and accepting help makes you strong. So let me shout this again. 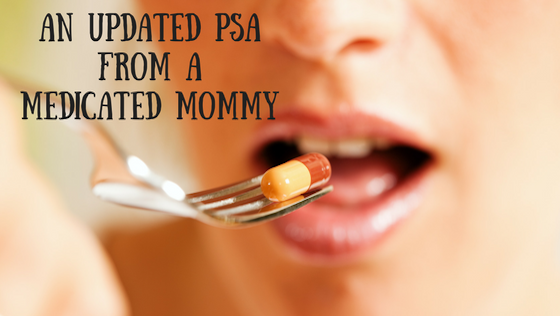 I AM A MEDICATED MOMMY AND I AM NOT ASHAMED! I do what I need to do to stay healthy and happy for my family and for myself. And that makes me a warrior mom. Rather than feel guilt or shame for having postpartum depression, I choose to celebrate my recovery. My son recently turned 3 and I love being his mommy. I may be a medicated one, but I’m also a fighter and a survivor. Here are nine reasons I’m grateful for my year-long battle with postpartum depression. 1. I realized my own strength. At first, I felt helpless. I never thought I would get better, but I went through the motions of doing what needed to be done to treat the postpartum depression—self-care, medicine and therapy. As time passed, I witnessed my true strength emerge. I transformed into a woman who decided to fight to get better for herself, her husband and her baby. Every day when I look in the mirror, I now see a warrior mom looking back at me. 2. I found my identity. During my pregnancy I envisioned who I would be as a mom (thanks social media)—a champion breastfeeder who immediately fell in love with her baby, a supermom making her own baby food, crafting, constantly cooing and carting her baby everywhere. When I actually became a mother, it was nothing like that. I didn’t enjoy any of those things. I thought something was wrong with me and it took lots of therapy to convince me there wasn’t. I felt stripped of my identity, but surviving postpartum depression allowed me to forge a new one. I had the identity of a mom who embraces and doesn’t apologize for who she is, rather than obsess over who she thought she was supposed to be based on the social norms of motherhood. Breastfeeding didn’t work out very well for me. I didn’t immediately fall in love with my baby or motherhood. I hated crafting, never made my own baby food, couldn’t do everything on my own and I never cooed. As I started to get better, I learned to accept these things about myself. I wasn’t like my best friend, the talented crafter who breastfed all her children for an entire year. I wasn’t like my own mom or mother-in-law. I was just me, the mom who fought to beat postpartum depression and fell in love with her son. That was enough. 4. I learned to speak my truth. When I was going through postpartum depression, I remember trying to find other women’s survival stories, but I struggled to find ones I related to. I wanted to know I was normal, would get better and was not alone. When I finally got healthy, I decided I could be this voice for other moms. I would openly and honestly share the details of my battle with postpartum depression. I wouldn’t pretend that motherhood came natural to me or I loved every minute of it. I would never make apologies for what I went through and who I became. 5. I let go of guilt and shame. I initially struggled with feelings of guilt and shame for missing so much of my son’s first year of life. Even when I think back on it now, the memories are fleeting because I just wasn’t all there and I wasn’t myself. Then, I remind myself the postpartum depression wasn’t my fault and I can’t change the past. My son was well cared for and loved during that time. I got better, fell in love with him and became the wonderful mom I am today. 6. I became aware of my limitations. After beating postpartum depression, I became extremely self-aware. As much as I understand the benefits of giving my son a sibling, I now know this is something impossible for me. My family is complete as a unit of three and adding another child to the mix would break me and probably my marriage. I’m not built to be a mother of multiples and so I choose to give my son a happy, healthy mom rather than a sibling. 7. I realized who my true friends are. While I suffered and fought the postpartum depression, some friends stuck by me and others kept their distance. One friend wrote me off for not making the effort to socialize enough. Another came to my house almost every day, got me dressed, took me for walks, helped me bond with my son and put me back to bed again. My long-distance friends called and texted each week to check in. These are the friends who remain my closest today — the ones who communicated behind my back to keep up with my progress and celebrated when I got better and became myself, “their Jen,” again. 8. I grew closer with my own mom. My mom became my rock during that first year of motherhood. I called her every day. Most times, it would be to cry hysterically and lament how I would never get better. She told me she would never let me stay that way. She helped me research therapists until I found the right one. She promised me during every phone call I would get better in time and she was right. She was one of my biggest cheerleaders then and continues to be even now. 9. I chose to help others. This year, I finally decided to start writing, something I wanted to do after getting healthy. I wanted to write honestly with a side of humor about motherhood and surviving postpartum depression, with the goal of giving moms permission to be themselves, be happy and let go of the fear of being judged by others. The truth is, we love our children, but being a mom is hard. Sometimes we don’t take to it immediately, sometimes we want to quit and be alone, and some of us need medication to get through it. I wanted to make that journey less painful and more authentic for moms everywhere. This article originally appeared on The Mighty on June 8, 2016.